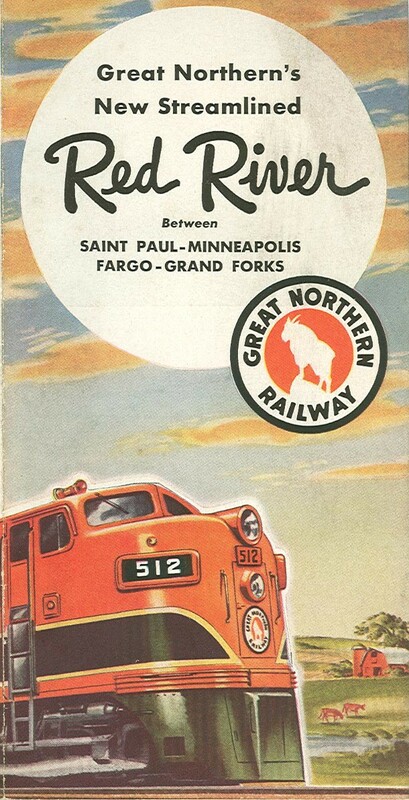 This is a May 1950 brochure about the route, schedule and amenities onboard GN's Saint Paul to Fargo to Grand Forks train, The Red River. 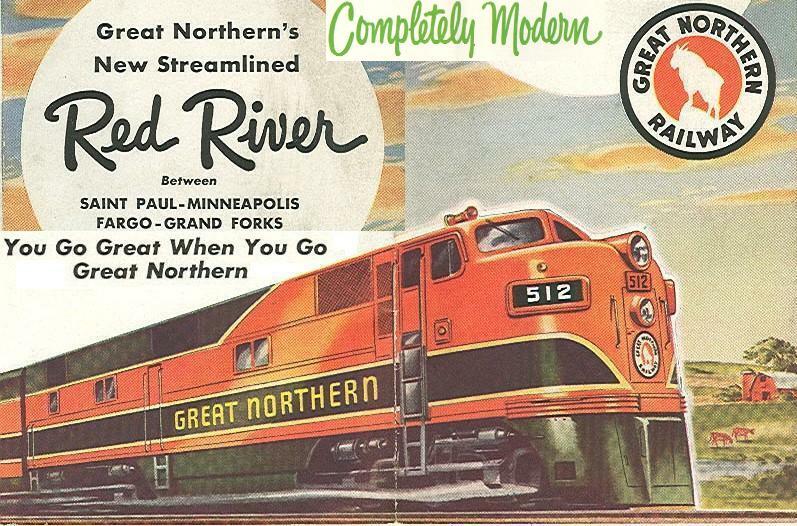 The RED RIVER is the newest member of Great Northern Railway's distinguished and growing fleet of deluxe streamliners. This all completely new streamliner consists of five cars — a baggage-mail, three coaches and a parlor-observation car, including a coffee shop and dinette — of lightweight streamlined construction. The RED RIVER offers a new Great Northern service to the territory served with faster schedules than any previously in effect on this route. The five cars were built by American Car & Foundry Company. The 2,000-horsepower diesel-electric locomotive was constructed by Electro-Motive Division of General Motors Corporation. In selecting the name RED RIVER, which is derived from the famous Red River of the North, Great Northern pays tribute to the great valley which is part of the territory served by the new streamliner. The finest in modern transportation the RED RIVER is another beacon of progress in the rich region served by Great Northern. As fresh as spring in our Northern wood and prairie land are the colors and designs chosen for Great Northern's RED RIVER streamliner. Coral, cream, gray and gold in panels and upholstery, form a soft background for the engraved plastic murals which highlight the ends of each coach. The wild prairie rose —State flower of North Dakota— and the moccasin flower —State flower of Minnesota— were selected for two of the murals. Blue gentians and golden sunflowers, which bloom so abundantly in the Red River Valley, decorate the other two panels. Rare carved glass mirrors in gold, silver, green and red accent the cool greens and grays of the parlor-observation. These carvings, too, are distinctly at home in the Red River country. They picture the sugar beet, potato, wheat and dairy farms which help to feed the nation and the world. More of the Minnesota and North Dakota feeling is introduced in the observation section by three fine bas-reliefs. These are carved in maple wood by K. George Kratina, noted American sculptor. Two carvings show farming activities and a grain elevator. The third is a symbol of the splendid hunting for which this region is noted, with its rhythmic frieze of flying Canada geese. Dashing red upholstery makes the counter Seats in the coffee shop as attractive as they are comfortable. Noise is eliminated by a counter-top of tan linen Formica, with a lighted purse shelf under the counter. Every decorative detail and every convenience is planned especially for this service. The new RED RIVER is more than an assembly of standard streamlined cars. It truly belongs to the valley for which it is named. The daily journey of the RED RIVER is a round trip between Grand Forks, North Dakota, and Minneapolis and Saint Paul, Minnesota, a distance of 320 miles each way. From Grand Forks, the route is by way of Hillsboro and Fargo in North Dakota. Crossing the Red River into Minnesota, the streamliner travels via Moorhead, Barnesville, Fergus Falls, Alexandria, Sauk Centre and St. Cloud before reaching the Twin Cities. The territory served is diversified, highly productive, scenic and historical. The fertile soil of the Red River Valley has made this the "bread basket of the world". Wheat, rye, barley, flax, dairy products, potatoes, vegetables, poultry and meat are shipped in almost legendary quantities from this region. From the windows of the RED RIVER you see an inspiring picture of American progress in the prosperous farms which roll to the horizon and beyond. Up-to-date farming methods are developed and encouraged by leading educational institutions — the experimental station of the University of Minnesota at Crookston, Minnesota and the University of North Dakota at Grand Forks, North Dakota. The area served by Great Northern's RED RIVER is famous for recreation as well as for work and progress. Your streamliner rolls through the heart of Minnesota's great vacation country surrounding Alexandria, Fergus Falls and other communities along the route. Many lakes and streams in northwestern Minnesota are noted for their splendid fishing, hunting and recreation facilities. James J. Hill, Great Northern Founder, predicted the great future of this region when he operated a Red River boat line as a young man in 1870. 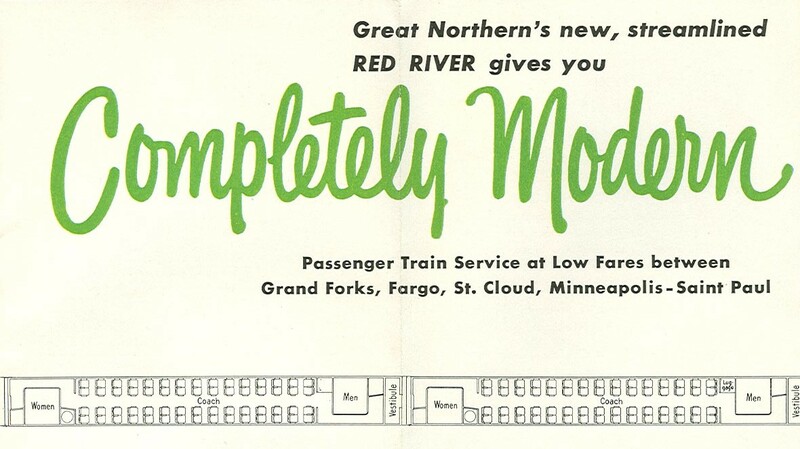 His predictions have indeed come true in today's flourishing Valley and in Great Northern's RED RIVER streamliner. The only "old" feature of the. new RED RIVER is Great Northern's good-food tradition, which long has distinguished travel by Great Northern. 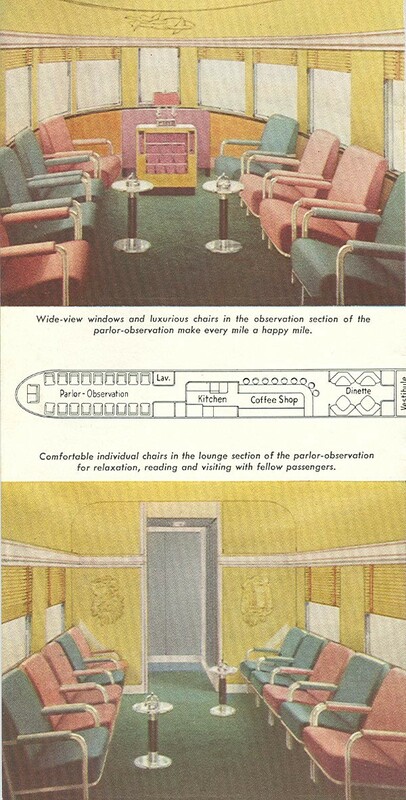 Full dining car service is offered in the dinette section of the parlor-observation car, serving a variety of a la carte and table d'hote meals at reasonable prices. Light snacks at economy prices are available in the adjoining coffee shop. All food is prepared in a fully-equipped and glistening stainless steel kitchen. Beverage service is provided by the attendant in the parlor-observation car with the dispensing of spirituous liquors being subject, of course, to state and local regulations. Tested improvements in railway equipment and diesel power for speed, easy riding and effortless stop-and-go are coupled with maximum strength and safety in the new RED RIVER. Electrically-controlled braking and tight-lock coupling of cars contribute to smooth starting and stopping. All windows are non-fogging type with shatterproof glass. Venetian blinds add to passenger comfort. Strong but restful illumination is provided by a combination incandescent and fluorescent lighting system. Ample luggage room in each car. Whether you travel on business or a vacation, your RED RIVER trip is sure to be a pleasure trip. Great Northern travel agents in principal U. S. and Canadian cities, your local travel or railroad ticket agent will gladly assist you with all your travel plans. The all-streamlined EMPIRE BUILDER daily between Chicago, Saint Paul, Minneapolis, Spokane, Portland, Seattle-Tacoma and California. 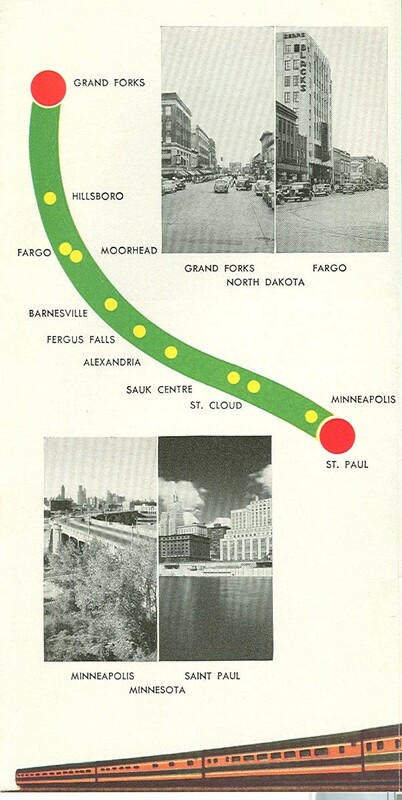 The diesel-powered ORIENTAL LIMITED daily between Chicago, Saint Paul, Minneapolis, Spokane, Portland, Seattle-Tacoma and California, via Grand Forks, North Dakota. Stops daily at Glacier National Park in the Montana Rockies, June 15 through September 15. Both trains connect in Portland with the "Shasta Daylight" to San Francisco. For RED RIVER connections with the EMPIRE BUILDER and ORIENTAL LIMITED, eastbound and westbound, see your local Great Northern travel agent, travel bureau or railroad ticket agent. 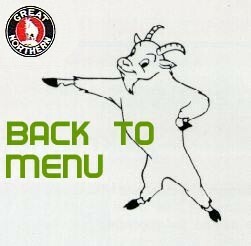 You Go Great When You Go Great Northern! Interior photo of women's lounge and dinette section of parlor observation car. 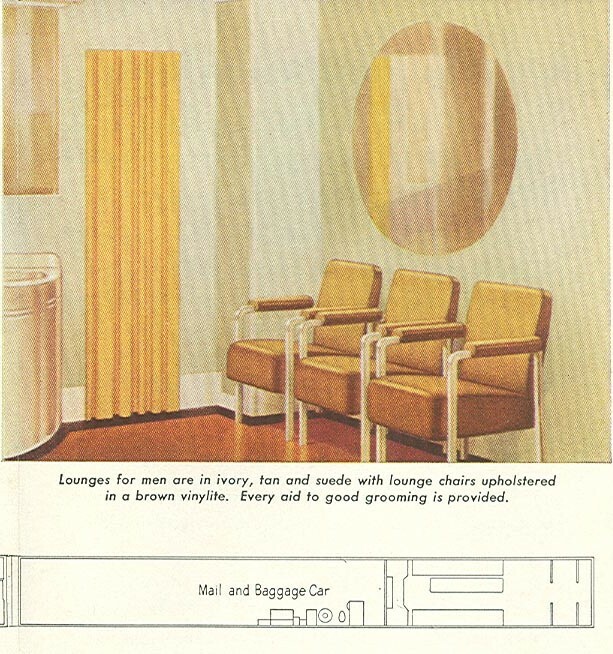 Interior photo of men's lounge. Hand-crafted cover photo from GNR Page April 2007 with parts taken from the Red River brochure.